Serving Irvine, Anaheim, and Other Surrounding Areas. Irvine has a special place in the hearts of the R&R team. This vibrant city in Orange County is home to a bunch of fantastic attractions, not to mention a lot of really great people. Because this is Southern California, whether you’re hiking Bommer Canyon, attending a concert at FivePoint Amphitheatre, or enjoying an eagle-eye view from the Great Park Balloon, you’re probably feeling pretty warm. Temperatures live in the 70s and 80s, dipping down into the 60s and maybe 50s at night. Though this is pretty temperate as climates go, HVAC plays a very important role in keeping people cool when those temperatures spike. The R&R Heating and Cooling team is proud to serve the people of Irvine with world-class air conditioning services. We know that your air conditioning system runs for a majority of the year, which makes it a significant energy expense for you as well as an integral part of your comfort. We believe your AC system should not only save you money but also give you peace of mind. That is why we offer the following services. Today’s air conditioners are pretty tough, but they aren’t invincible. When they have trouble or get outdated, they not only cause discomfort, they can also guzzle electricity. The R&R team will respond quickly to any signs of trouble you report, quickly diagnosing whatever is going on and solving it just as quickly. For all your air conditioning repair needs in and around Irvine, get in touch with R&R Heating And Cooling. An ounce of prevention is truly worth a pound of cure. Regular air conditioning maintenance not only prevents you from experiencing catastrophic failure, but having to pay for issues that have gotten out of hand. We can stay on top of your air conditioner’s health, spotting little issues and fixing them before they get too big. Call us for all your air conditioning repair and maintenance needs in Irvine and surrounding Orange County communities. If your air conditioner should have been retired 20 years ago or it isn’t suited to your needs, turn to R&R Heating and Cooling for excellent installation or replacement. 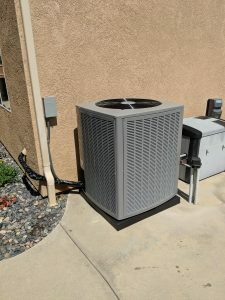 As a top A/C company serving Irvine and beyond, we will make sure that everything is set before we go because we want you to enjoy cool air trouble-free for years to come. Saving money is always a good idea. Fortunately, today’s air conditioners have been designed to make your energy budget go further. We would love to discuss what kind of air conditioning system would fulfill your home’s unique cooling needs while leaving more money in the bank. Contact R&R Heating And Cooling, your local HVAC contractors, for not only air conditioning repair services, but also to learn how to make your home more energy efficient.